I recently heard the results of a poll that I found surprising: 50% of Americans report having had a “spiritual experience,” but of that group, 80% say they never want to have another. That was exactly the opposite of the 70 or 80 people who gathered on Saturday for a daylong retreat with Anam Thubten Rinpoche, sponsored by the Sacramento Buddhist Meditation Group. Rinpoche is a Tibetan word meaning, “precious one,” and is usually only applied to those recognized as reincarnations of spiritual leaders or teachers of the past, most famously, the current 14th Dalai Lama. It should be clear that any culture like Tibet, that believes in Rinpoches, is not using the concept of “no-self” to tell us we don’t exist or that life does not continue after death. In Anam Thubten’s vision, “no-self” means an end to the painful illusion of seperation, an end to isolation, an end to living in a friend-or-foe, fight-or-flight world. Yet although he mentioned this concept, which first drew me to his teachings, on Saturday he had a different focus, “Primordial Mind,” the unconditioned and indefinable base of what we are, prior to concepts, prior to ego, prior to all delusions. The experience of this spacious mind is surprisingly near if we are willing to let go of fixed concepts, and practice a simple meditation technique, and if we are motivated by devotion, by longing for union with the absolute the way a thirsty man longs for water. 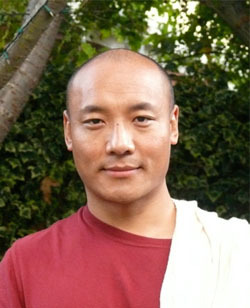 Anam Thubten’s book elaborates the concepts we need to let go of as well as his favorite meditation practice – the simple but difficult art of learning to relax and let go of effort, even the effort to meditate “well.” This longing – for God or the guru or Buddha; for oneness, or emptiness or, selflessness, or enlightenment – however we conceive of the ultimate good, is finally a longing for love, he said, and this is what remains when our fixed ideas break down. In Anam Thubten’s teaching, God is love, or Buddha Nature is love, as it is in the words of many other spiritual masters. This entry was posted in Buddhism, Meditation, Spirituality, Tibet and tagged Buddhism, Meditation, postaweek2011, spirituality. Bookmark the permalink. i had bewildered times to apprehend what actually the sort of teachings like living with “no self”, “no mind”, “no attachment” really meant. And, what it would be like especially in this material world with race to secure our own had us colliding with each other. first, no self, no mind, no attachment life would be like the lotus. its root is under the water stabbed into the soil while the leaves hanging on the surface with the flower blooming into the air. one can’t be without the worldly necessity, but one can be happy while not having it. it is about setting the mind, no, it actually is about ruling, better: creating the mind, best: not minding (with not having). if you are a fish, you’d be swimming under the water, if you are a bird you’d be above the water. if you are a frog, chances you’d be under the water and above it sometimes. but, since you are a human, you can enjoy the water under and the air above if only you have nothing against the water under or the air above. secondly, living with that teachings should be like a guitar strings. one string represents an idea, the other string represents another idea. to achieve harmonious sounds, to live the life full of peace, one string should not be at a tension too tight nor to loose against the other string(s). third, it is also about starting with any concept and ends without any concept. there’s a saying, “the highest tao is the tao that is not spoken nor explained”. i think way of “no self”, and so is “no mind” is about experiencing it, one own self journey. something about an infinite-what that wants to be described through simplification would not be satisfactory, it is like an effort to put the whole ocean into a milk bottle. so, the only way to do it is by put some of the water from the ocean into the bottle and keep pouring it. you’ll have a question then about the volume of the bottle against the ocean’s, ..the answer is…: (only if you ask). The concept can be bewildering, in fact I was put off the first time I came upon it. Later, I happened to have a (lucky) spontaneous experience of no-self and found it very joyous, like taking of a warm coat when you enter a hot room. About a month after that, I attended my first retreat with Anam Thubten, whose concepts helped me make sense of it. Either way, you are playing the game, noting the rules, trying to do what needs to be done, but which brings the most pleasure. Experientially, I think at those moments when we are most engaged in our lives, that concept of “I” and “How am I doing?” are absent. If you want to pursue this further, I do recommend Anam Thubten’s book. If you click on the image in the article, it will take you to the publisher’s page where you can see more about it. Thanks for stopping by my blog, and please come back.